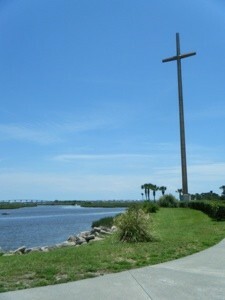 This is the 208 ft. high cross at the Nombre de Dios Mission in St. Augustine, Florida. It is sheathed in stainless steel panels and stands upon a granite base, and it's really beautiful to see it shining in the tropical sunlight. That's actually what inspired me to snap this pic! To the left, you can view the Usina Bridge in the distance. This mission is such a peaceful location, with the ocean lapping at the rocks and its beautiful landscaping and scenery, and it has historic appeal dating all the way back to 1565. My husband and I had a wonderful experience visiting Nombre de Dios in May of this year, and I'm glad to get to share it with others, too. And thank you for sharing it with us.